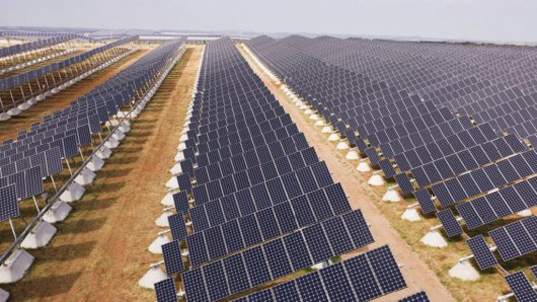 Two solar power giants in the US are embroiled in a legal face off which has industrial espionage and intrigue written all over it. Commercial solar supplier Sunpower is hitting solar installer SolarCity with a lawsuit claiming it stole confidential information. The claims are against five ex-Sunpower employees who downloaded “tens of thousands of documents and confidential data” and SolarCity, who allegedly accepted the stolen information. The lawsuit pits the biggest supplier of solar in California against the nation’s largest residential installer, and to raise the stakes even more, Solar City was looking for an IPO in the third quarter of 2012, which now could be pushed back. The claims are that Tom Leyden, a managing director of Sunpower, copied sensitive information on sales and customers’ information from a database days after he no longer worked for the company. Other employees also allegedly took data that “would take years to independently develop” according to Sunpower’s head of North American sales, including business plans, financial analysis and other sensitive documents. Leyden is indicated to have been the ring leader and employed at least three other employees to gather data to turn over to Solarcity in order to help them with their commercial sales operation. This is a exceptional breach of data on Sunpower’s part, and if questions about the viability of SolarCity’s business plan and liability in this case are serious enough their planned IPO may be shelved for a while. I just heard of another case against Solar City-- my neighbor's friend is suing them for a bad consult. Two solar power giants in the US are embroiled in a legal face off which has industrial espionage and intrigue written all over it. Commercial solar supplier Sunpower is hitting solar installer SolarCity with a lawsuit claiming it stole confidential information. 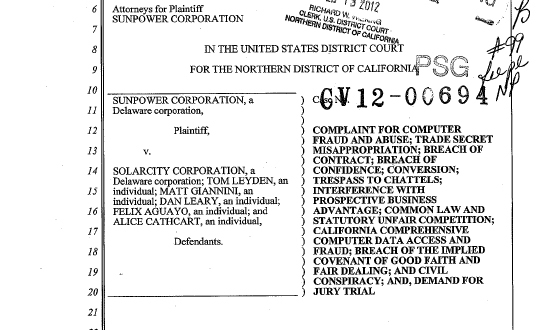 The claims are against five ex-Sunpower employees who downloaded “tens of thousands of documents and confidential data” and SolarCity, who allegedly accepted the stolen information. The lawsuit pits the biggest supplier of solar in California against the nation's largest residential installer, and to raise the stakes even more, Solar City was looking for an IPO in the third quarter of 2012, which now could be pushed back.